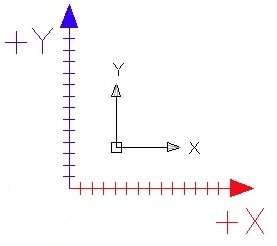 In order to successfully place and manipulate objects/images in Cocos2d, you have to understand its coordinate system. The origin of the Cocos2d coordinate system is always the lower-left corner. It cannot be changed. The x-axis increases as you move to the right of the screen. The y-axis increases as you move up the screen. A sprite’s origin is its lower-left corner, just like with the application itself. It cannot be changed. Example: A 6x6 pixel square positioned at (4,4) will be centered at (4,4) and have its corners at (1,1), (1,7), (7,1), (7,7). The setAnchorPoint() function takes two values: (xI,yI). These values can range from 0 to 1. The pair (0,0) represents the lower-left corner of the image and the pair (1,1) represents the upper-right corner or the image. The pair (0.5,0.5) represents the center of the image. Once you change the anchor point, the sprite will be positioned on the screen based on that point. However, parents can also be other sprites/objects. If that happens, the sprite is assigned its position based on its parent’s origin, not the application’s. That means if the parent object is later moved around, your (child) sprite will move, too!